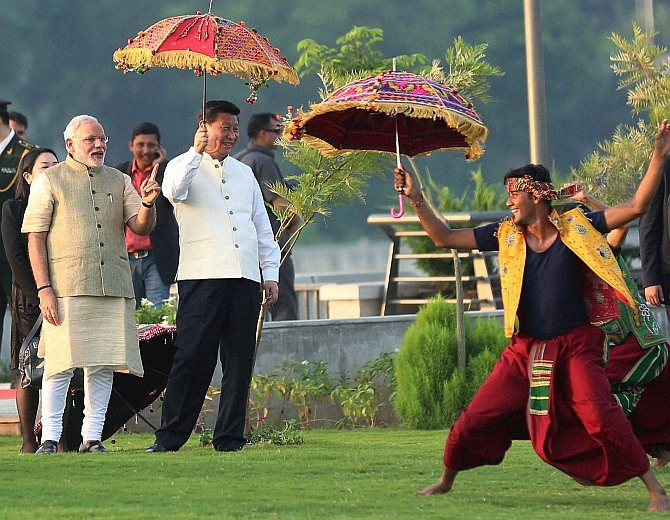 'Demchock and Chumar are important crucibles for both China and India to know about the other. While India 'learns,' she also need to 'teach,' suggests Lieutenant General Anil Chait, one of the Indian Army's most cerebral thinkers, who recently retired as chief of the Integrated Defence Staff. Why are important visits in the Indo-Chinese context, accompanied by physical intrusions across Line of Actual Control? Why do nations show tactical aggressiveness under conditions of strategic stability? Is it because China's People's Liberation Army is a rogue military or is it, because it has become such a professional force, that it does what it thinks is right in spite of being ordered to retrace its futile aggression. Or is the action a measurable and demonstrable response to what Prime Minister Narendra Modi said in Japan while condemning the revisionist nature of countries in the context of the 21st century. 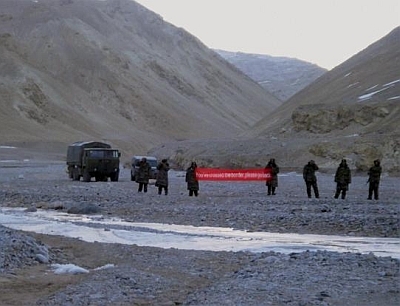 Large numbers of questions have yet again surfaced and it will take a deeper analysis to understand the intent behind the Chumar incident in Ladakh. The withdrawal as ordered by Chinese President Xi Jinping, who heads the Communist Party of China and is also the Chairman of China's Military Commission, was expected to be completed by Tuesday, September 30, a full 13 days after being informed of the Indian desire to return to the pre-September 10 position, during the visit. This indeed is the 'strategic baggage' that Xi has left behind, post his India visit. Does it need to be borne or discarded considering the factum of growth, equity and the Bangladesh-China-India-Myanmar initiative? Or, in the context of geo-economics becoming the currency of power, does India need to forget this incident as a one off and build on trade and commerce? The Chinese would find it very hard to establish that the ingress into Demchock and Chumar was not pre-planned and specifically timed to coincide with President Xi's day of meetings with Prime Minister Modi. The Indian narrative and approach much to their expectation was on expected lines -- accept the dispute and the issue of peace at the borders as a necessary pre-condition to good neighbourliness and keep India boxed into the currents and vortex of South Asia. The dust raised by the ingresses in Ladakh did impact the discussions in Delhi and though 13 agreements were signed, the overall mass of agreements is short of the expectations and hype, built in anticipation of the visit. The expected 'orbital jump' clearly did not happen. What instead emerged is that activities on the Line of Actual Control for India are the prime determinants of the relations between the two countries. Xi resorted to the fig leaf of an explanation about where the LAC lies being the cause for such incidents. This has throughout been the ploy, adopted by the PLA to inch themselves onto strategically dominant features and areas. India's quiet acceptance of reversals has emboldened them. A momentous visit such as Xi's could have been a platform for a new beginning and marking the LAC would have been amongst the foremost of proposals to bring relations to an even keel. That has been thwarted as of now for want of clarity. The expression of intent to address the issue with urgency and on the contrary reinforce the area, with additional troops instead of withdrawal, reflects the strategy of the strong for projecting generic claims over the disputed territory. The opportunity to understand as to how China would react to a similar transgression from the Indian side when a high-level visit from India occurs should be contemplated. What should be India's response? First and foremost is to enhance its military capabilities in the region. There is no other lever that India holds to push China, least of all economic and trade. Cultural ties are good for table atmospherics, but provide little force at candid discussions. As it does, the diplomatic push for demarcation of the LAC has to be made. Unlike the Line of Control, this should be on technologically enabled maps that cover the entire length of the disputed border. The border defence management has to be extremely effective and responsive for preventing the face offs to continue endlessly. Next, India needs to review its position on Tibet, the Dalai Lama, and definitely facilitate addressing of the concerns of the Tibetans. Modi has experienced the 'toothache' of dealing with our northern neighbour in spite of his having done all that was right to convey that this was a new India. That message does not seem to have been fully understood by the Chinese. It is he who has got to realise how slippery and unreliable a social, cultural, economic and military entity, the Dragon is. Not being the archetypical wavering acquiescing politician of yore, who chose to put the dust of diplomatic hogwash into their own eyes, we can expect more resolute Indian responses in the future. The strength of an elephant is in its resolve to dig in and stay put. That is the first requirement to keep a fleeting dragon from venturing out of its den. Lieutenant General Anil Chait recently retired as chief of the Integrated Defence Staff; he was also Central Army Commander. Was the Chinese intrusion really a PLA strike against Xi?